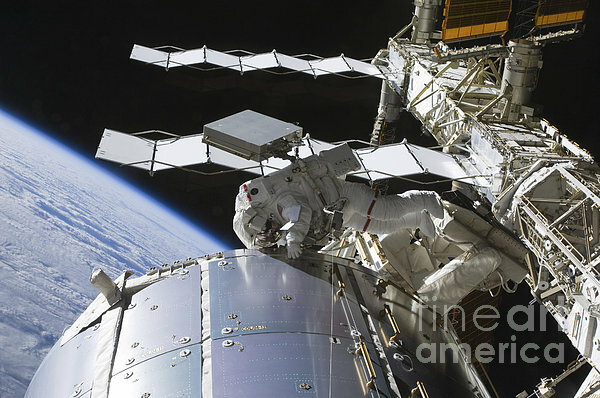 Astronaut participates in a session of extravehicular activity (EVA) as construction and maintenance continue on the International Space Station. 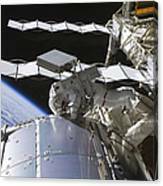 During the spacewalk, astronauts removed an empty ammonia tank from the station's truss and temporarily stowed it on the station's robotic arm. 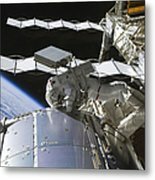 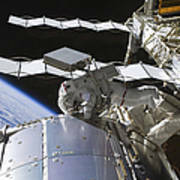 They also retrieved the European Technology Exposure Facility (EuTEF) and Materials International Space Station Experiment (MISSE) from the Columbus laboratory module and installed them on Discovery's payload bay for return.